What an interesting year Singapore has had. National Day is coming up soon, and some of you will be looking up best places to see the annual firework extravaganza. You'll want to be close to the Marina Bay Floating Platform where the National Day celebrations are held. 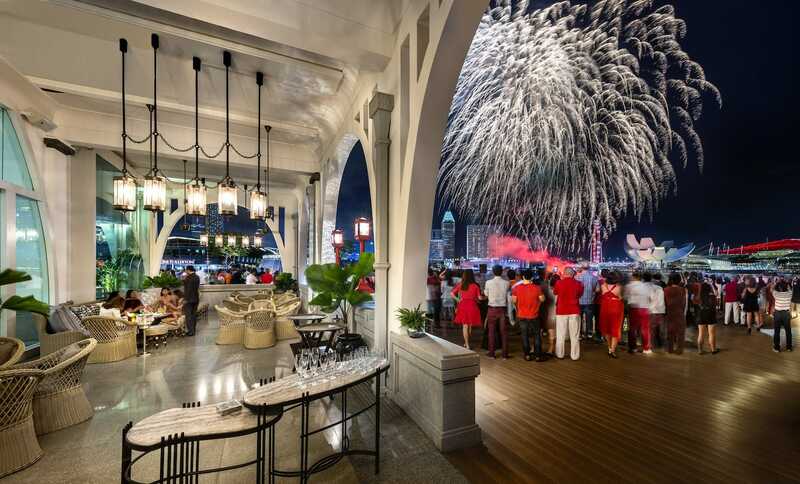 In this respect, The Fullerton Hotel Singapore and The Fullerton Bay Hotel Singapore offer vantage views of the parade and fireworks displays throughout the historic waterfront precinct. The stunning nightscape and fireworks are already unfolding progressively from 2 July to 9 August 2017. If you're lucky to get a reservation, you'll be able to hear the roar of celebrations from the comfort of the luxurious guest rooms at The Fullerton Hotel – Singapore’s 71st National Monument (see National Day Package) – or from the private guest balcony in the rooms at the Fullerton Bay Hotel (see National Day Package). Or you could celebrate at the One Fullerton Rooftop, the Lantern rooftop bar and The Clifford Pier al fresco deck with family and friends over free-flowing drinks with the fireworks overhead. But let's talk another way to see the fireworks...with food! The Fullerton Hotels’ restaurants and bars offer vantage views and menus priced from S$52*. There are selections crafted in tribute to our heritage, such as a Deconstructed Chicken Satay, or a more classic Sambal Sea Bass with Cincalok and Calamansi Baked in Banana Leaf at the newly revamped La Brasserie; or petite bites of Chilli Crab Bun in our three-tier Afternoon Tea Sets at The Courtyard and The Landing Point. 2, 8, 15, 22, 29 July and 5 August, from 6.30 p.m. to 10.30 p.m.
Head down to The Clifford Pier where dine-in guests are granted free access to the al fresco area of the pier. It is a fantastic vantage point for viewing of the fireworks. The table package (inclusive of one glass of housepour wine, spirits, beer, soft drink or juice per person) gets you a National Day Platter, consisting of Kampung-style Charcoal Grilled Chicken & Beef Satay, Singapore-style Chilli Crab Gravy in Mini Bun, and Pork and Crabmeat Ngoh Hiang. A cover charge of S$52 nett per person applies for regular walk-ins, inclusive of two complimentary glasses of champagne, wine, beer, housepour spirits, soft drinks or juices. 9 August, from 11.00 a.m. to 1.30 p.m. (first seating), 1.30 p.m. to 4.00 p.m. (second seating) and 7.00 p.m. to 11.00 p.m. The distinctive setting of Clifford Pier is the backdrop for diners to experience a relaxing National Day Dim Sum High Tea which includes highlights such as Kampung-style Charcoal Grilled Chicken and Beef Satay, Singapore-style Chilli Crab Gravy with Crispy Mantou, and The Clifford Pier’s Signature Prawn Laksa alongside a wide assortment of classic Dim Sum like Steamed Siew Mai with Crab Roe and Steamed Char Siew Pau. The Clifford Pier’s National Day Seafood Buffet is where you will indulge in premium ocean catch like Freshly Shucked Oysters, Poached Live Prawns, and Salmon Confit with Fish Roe. The seafood spread is accompanied with all-time favourites like Hainanese Poached Chicken and Aromatic Ginger Rice, Honey-glazed Pork Char Siew and Kampung-style Charcoal Grilled Chicken. Free-flowing red or white wine and beer is available at S$49* per person. 9 August, from 12.00 p.m. to 3.30 p.m. and 6.30 p.m. to 10.30 p.m.
Bask in nostalgia as you join the nation in celebration along the scenic Singapore River at the al fresco terrace of the restaurant. Spend an idyllic afternoon indulging in a spread of gourmet delicacies at Town Restaurant’s National Day Singapore High Tea Buffet () with local favourites such as our Signature Laksa, Singapore Chilli Crab with Mantou, and Traditional Popiah and Kueh Pie Tee. With Singapore’s reputation as a food paradise, feasting on traditional local hawker dishes is a fitting way to celebrate her 52nd birthday. Catch the live screening of the National Day Parade on large flat-screen TVs in the comfort of the plush interiors. Highlights of the buffet include Freshly Shucked Oysters, Herb-roasted US Prime Rib, and a selection of the Freshest Tuna, Yellow Tail, Salmon Sashimi. At Jade’s Dim Sum Buffet, the award-winning chefs bring you 55 varieties of exquisite dim sum, soups, main courses and desserts to delight the whole family. Unique creations include Golden Mantou stuffed with Spicy Crab Meat, Steamed Pork Siew Mai with Abalone, Braised Bird’s Nest with Truffle Egg White in Superior Broth, Boiled Congee with Lobster and Dried Scallops. Share moments of joy with family and friends amidst the refined ambience of Jade. Savour roast delights in such as Peking Duck Roll and Sliced Roasted Suckling Pig, Stewed Pork Trotter with Sour Plum in Claypot and Cream of Almond with Pistachio Glutinous Rice Dumplings. *All prices are subject to service charge and prevailing government taxes. ^Children aged 6 to 11 years old. Photo courtesy of Fullerton Hotel.